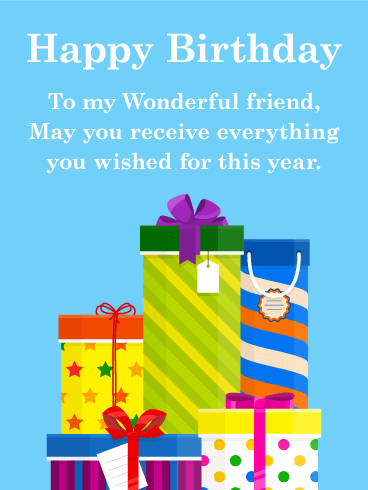 This Happy Birthday card that is filled with presents would be perfect to send to your friend on their special day. This is because presents are a big part of a birthday celebration! 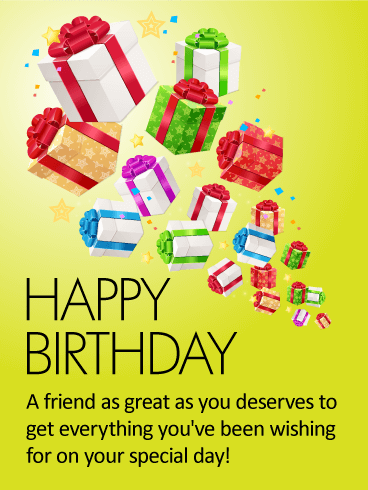 It features many colorful presents which will certainly get your friend excited about his or her birthday! 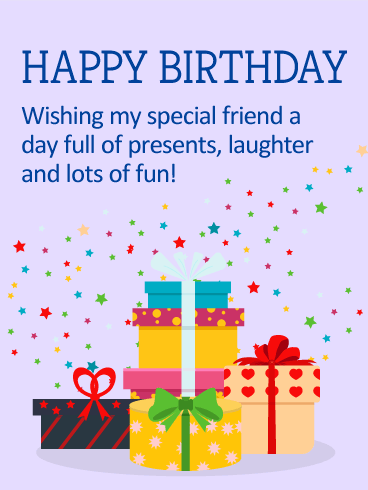 Send your friend this great birthday card, it will certainly make them smile! 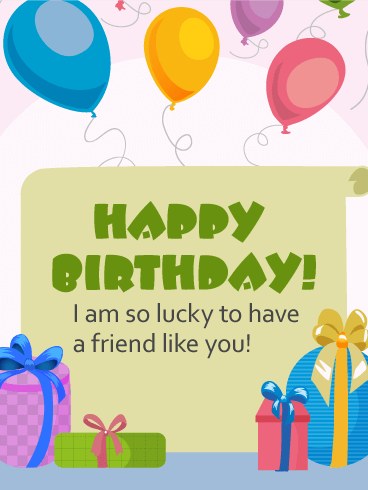 This Happy Birthday card is the best, and your friend will really enjoy receiving it! It features presents and balloons that are brightly colored with yellow, purple, pink, and green, perfect birthday colors! 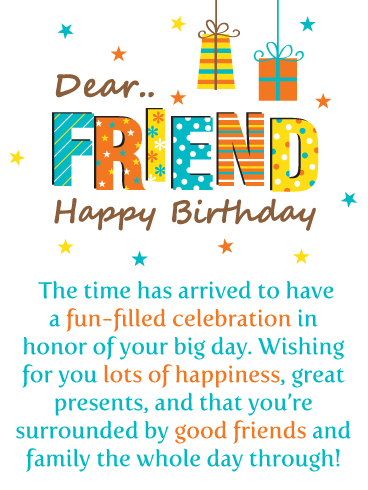 Plus, the Happy Birthday lettering pops out against the orange background, it's the first thing your friend will see. 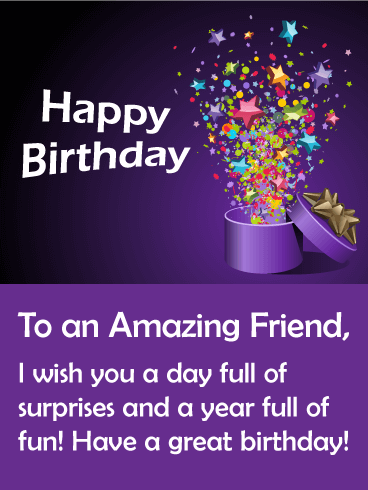 Imagine how surprised your friend will be when he or she receives such an awesome birthday card! Some friends are more precious than gold, and yours is surely one of them. 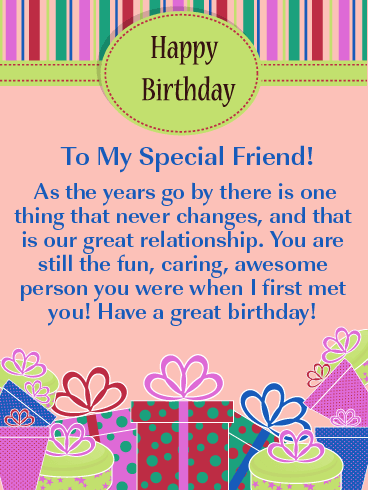 Let her know how much she means to you on her special day with this birthday card. 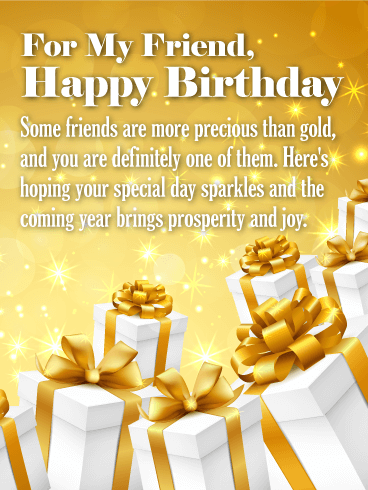 It is full of beautifully wrapped white birthday presents with golden bows stacked on a glittering gold background. Surprise! This star-studded birthday card wishes your friend a day full of surprises. That’s what birthdays are all about, right? And why stop there-wish them a year full of fun! 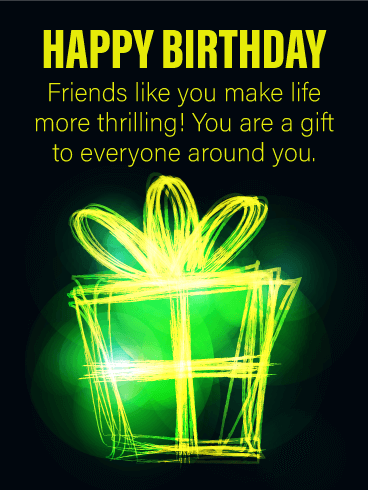 This special birthday card is festive and thoughtful and great for a friend who knows good times are always just right around the corner. 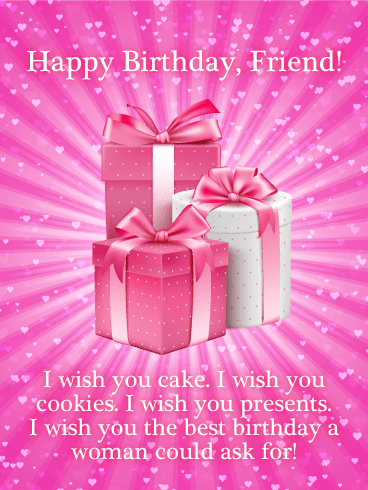 Send this birthday greeting card to your amazing friend today. Their friendship is a gift to you. Let them know with this heartfelt birthday card! Small packages, each one beautifully wrapped, are scattered across the top just waiting to be opened. Set against a bright blue background, they're joined by your touching sentiment below, which they'll remember from year to year because it came from you. Surprise! 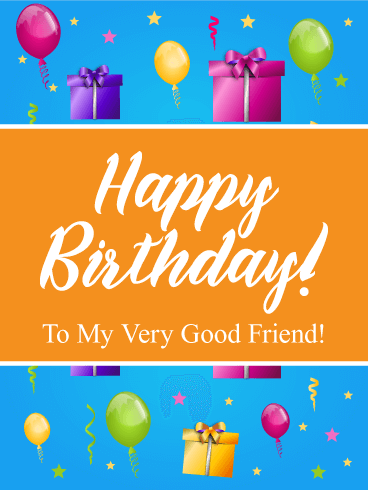 This exciting, colorful birthday card will bring a world of excitement into a friend's birthday while letting them know how special they are to you! 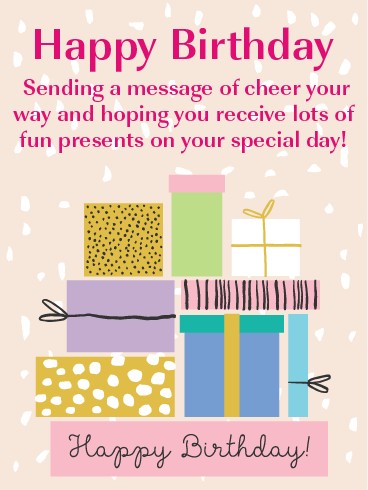 Brighten up their birthday with the thought of ribbons, confetti, stars, and music by sending them this card today! A good friend is a rare gift! 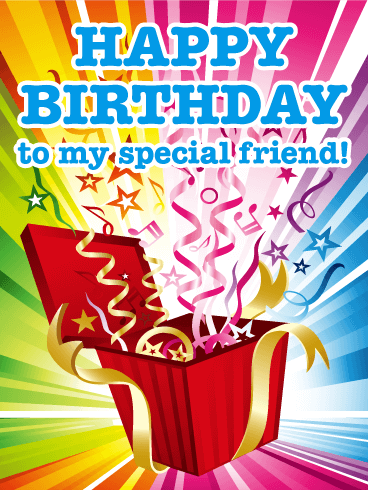 Celebrate your friend's birthday with this colorful birthday card. Nothing says "Happy Birthday!" like presents and balloons. 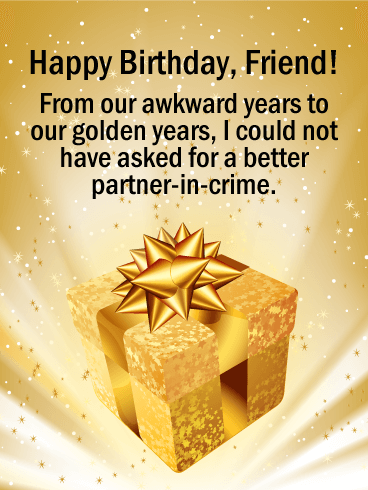 This fun birthday card is perfect if you want your friend to know just how much they mean to you. 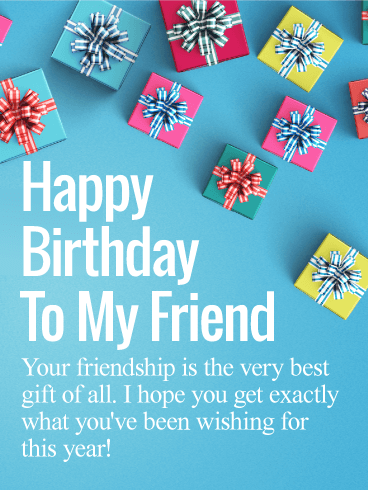 The best present is the gift of friendship. 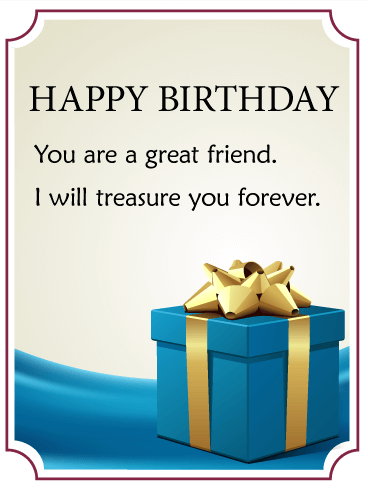 Tell your friend how much you value them with this sincere and sophisticated birthday card. 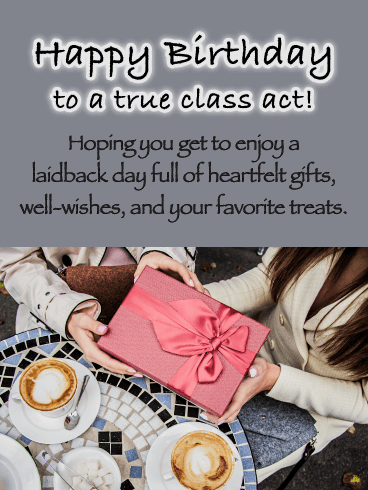 The chic, blue box, and gold bow make this both a beautiful and a thoughtful birthday card to send to a great friend.